I first came to Vasily Grossman via excerpts in Ivan’s War, Catherine Merridale‘s amazing book about how ordinary Soviet soldiers experienced the Second World War. That prompted me to pick up A Writer at War, dispatches and stories that he wrote while working as a journalist near the front. I thought it was one of the best non-fiction works I read in 2006. Some years after that, I decided to pick up one of his major works, and this year I finally plucked Life and Fate off of the to-be-read shelves. No need to hurry with a gigantic Russian novel, right? The title, size, sweep and subject matter all invite comparisons with War and Peace, and in my view, halfway through the book, Grossman more than holds his own with Tolstoy. Grossman chose the battle of Stalingrad as the centerpoint of his novel, and he evokes the months of devastation leading up to the turn of the tide, showing what relentless combat has done to both city and soldiers. He spends considerable narrative time in a house near the legendary Tractor Factory, where the Wehrmacht wave finally broke against Soviet resistance. Grossman details the soldiers holding out in a house that is surrounded by the German army, yet never gives in. He shows how little their resistance had to do with any great ideals, let alone Soviet ones (a political commissar sent to instill Bolshevik discipline is sent back wounded in a stretcher after just one night, with Grossman strongly implying that the Soviet soldiers grazed his head with a bullet) and far more to do with stubbornness and not letting one’s immediate comrades down. He shows how both cruelty and unexpected humanity existed side by side, sometimes mere moments apart in the same person at the front. 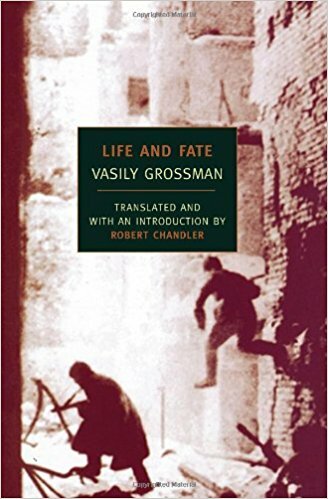 While Grossman focuses on the specific in each of the generally short chapters — the translator’s introduction compares them to Chekhov’s short stories — the sweep of the whole encompasses all of the Soviet war in Europe. The eight-page list of characters in the back of the book would do any fantasy series proud, and I have to admit that as a semi-casual reader I don’t keep all of them and their interrelationships straight. I prefer to be carried along by the book’s powerful currents, sometimes at the front, sometimes at regional headquarters, sometimes at a research institute that’s been evacuated to the interior, sometimes on a prison train, and much more. “The thoughts of these men may have been trivial — an abandoned dog, a hut in a remote village, hatred for another soldier who’s stolen your girl … But these trivialities are precisely what matter. “Human groupings have one main purpose: to assert everyone’s right to be different, to be special, to think, feel and live in his or her own way. People join together in order to win or defend this right. But this is where a terrible, fateful error is born: the belief that these groupings in the name of a race, a God, a party or a State are the very purpose of life and not simply a means to an end. No! The only true and lasting meaning of the struggle for life lies in the individual, in his modest peculiarities and in his right to these peculiarities.” (p. 230). Of course such views were rankest heresy during the Soviet period. Grossman wrote Life and Fate during the Khrushchev thaw, but even a climate that allowed One Day in the Life of Ivan Denisovich could not countenance publication of Life and Fate. It was confiscated, all of the copies that the KGB could find were confiscated, and so were the very typewriter ribbons that produced it. The only other book to merit such thorough attempts was The Gulag Archipelago. By and large, though, Life and Fate is seldom polemic and almost always illustration. Grossman lives up to his ideals by showing readers individuals, their modest peculiarities, and how they live their lives (or lose them) in situations that are at once mundane and extreme. It’s a magnificent book, encompassing such vast experience, such varied fates, so much life.